This was a hard review for me to write because I didn’t know how to start it. I’ll be honest I didn’t know much about Floyd Norman until a few years ago when it came out about him being let go from Disney yet he still came to work. My first thing that came into my head was how come I didn’t know about this black person who worked at Disney Animation when Walt Disney was alive? Why am I just finding out about him now? Fast forward and now I’m watching a documentary about his career and life. Through the 94 minutes, I learned about a humble artist who was a trailblazer that is not celebrated as much as he should be but also a man that doesn’t wish to make a big deal about himself and his place in history. The documentary starts out with Floyd at that point in the modern history of being let go yet still coming to the studio each day to sit at his desk and work on commissions and other freelance work while also being a piece of living Disney history that is in a way taken for granted since he’s always just there. The film then follows what you would expect from a documentary about a man’s life. His childhood and where he grew up and his interested that lead him to his vocation. What is nice about this is that Floyd is the complete focus, there is no authorial character. That’s something to note these days as so many of documentaries the director is a character of some sort it’s either their journey of discovery or their interactions with this amazing person. This film just lets you learn about Floyd throughout major parts of his life – falling in love and getting married, filming the Watts riots with his filmmaking partner, his times at Disney working on classic films. The film has a lot of time to show you Floyd talking about himself that in a way it seems he’s uncomfortable with since he doesn’t seem that caught up in ego but yet telling it in a way that feels reflective being he’s 81 years old. Floyd also is shown that he cares very much about the issues of blacks in America but isn’t a person to be yelling in the street, that he makes art and communicates to world in that way. I think the film also shows a major issue within animation is that of ageism. That at a certain point in your life you are kind of thrown away especially if you don’t try to climb the ladder. This is stuff I’ve heard from others within the industry and honestly is something affecting many in the creative arts fields. 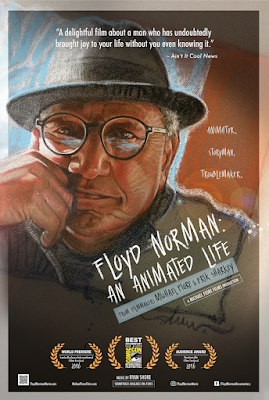 For me Floyd Norman: An Animated Life is one of the best and most important documentaries I’ve seen all year. It’s a subject close to me being that from time to time I can be considered and artist and while making comics isn’t being an animator I can say I can empathize and also greatly look up to amazing man and his life. I hope many people can see this film and share with as many people they can so that more and more people can know and celebrate Floyd Norman.